What is corrected reticulocyte count? What's the reticulocyte production index formula? How to use the reticulocyte index calculator? The CRC - corrected reticulocyte count calculator estimates the reticulocyte index in the patient's blood, taking into account their reticulocyte and hematocrit levels. It is calculated similarly to the raw reticulocyte count, but, to avoid misinterpretation in anemic patients, the result is corrected using a coefficient of reticulocyte maturation. In the advanced mode, there is also an option to input a desired normal hematocrit value. If you read on, you can learn the reticulocyte production index formula. Corrected reticulocyte count (CRC), sometimes called reticulocyte index (RI), is a parameter for bone marrow response assessment used in the diagnosis of anemia. The reticulocyte index of a healthy person should be between 0.5% and 2.5%. If the patient has anemia (hemoglobin of less than 13 to 14 g/dL in males and 12 to 13 g/dL in females), a reticulocyte index of less than 2% does not indicate loss of red blood cells, but decreased production of reticulocytes. Patients with an inappropriate marrow response may be further evaluated for nutritional deficiencies or bone marrow abnormalities. A CRC of more than 3% in a person with anemia indicates loss of red blood cells (from causes such as destruction, bleeding, etc. ), with an increased compensatory production of reticulocytes to replace the lost red blood cells. A value of 45% is most frequently used as normal hematocrit (normal_Hematocrit), but you can change it in the advanced mode in the reticulocyte index calculator. Maturation is a coefficient used to correct for the longer lifespan of prematurely released reticulocytes in the blood, which is a phenomenon of increased red blood cell production. This factor equals 1.0 for hematocrit of 36-45%, 1.5 for hematocrit of 26-35%, 2.0 for hematocrit of 25-16%, and 2.5 for hematocrit of 15% or lower. You can see the assigned value by clicking advanced mode. Enter the patient's hematocrit (Hct) level in %. Enter the reticulocyte level in %. If you wish, enter advanced mode to change the normal hematocrit in %. 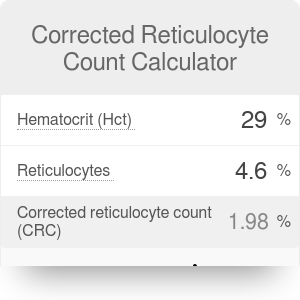 The calculated corrected reticulocyte count is provided in % in the last field. Corrected Reticulocyte Count Calculator can be embedded on your website to enrich the content you wrote and make it easier for your visitors to understand your message.